➜ Review of Melanie Yergeau. Authoring Autism: On Rhetoric and Neurological Queerness. Raleigh: Duke University Press Books, 2018. Some years ago, I read Melanie Yergeau’s “autie- ethnographic” account of her experience of being invol- untarily committed to a psychiatric ward during her sec- ond week as a professor of English at the University of Michigan. This was, she recounts, a surreal expe- rience, in which she faced various health care profes- sionals claiming that this was no longer Yergeau her- self acting and talking, but her condition—autism. As an autistic person, conventional theory and popular belief hold, she lacks insight into her own behavior and that of others. For Yergeau, this denial of agency and rhetoric has been a familiar situation ever since she was diag- nosed as a young adult. “Suddenly,” she writes, “with the neuropsychologist’s signature on my diagnostic papers, I was no longer my body’s author” (p. 1). Autism ac- tivists and scholars have long criticized that past and cur- rent theories of autism—from Bruno Bettelheim’s Empty Fortress (1967) to Simon Baron-Cohen’s theory of mind and mindblindess—deny autistic people subjectivity and personhood, in effect dehumanizing their very being. This leads to the ironic situation that autistic authors of- ten find their authorship questioned. sonhood. Yet she also suggests that such partial or residual rhetoricity can be a tool for reclaiming autistic agency, an approach she further explores in chapter 4. Chapter 2, “Intervention,” looks at the history of applied behavioral analysis (ABA) as the most common and per- vasive therapeutic intervention used with (on?) people with autism. ABA originated in behavioral psychology and breaks down behavior into small units, in which sub- jects are then repeatedly trained or taught and in the pro- cess are rewarded for success and punished for noncom- pliance. It is not concerned with the cause or nature of the condition in question, but “with reinforcing and ex- tinguishing antisocial (or inappropriate) patterns” such as autistic stimming, echolalia, or repetitive behaviors (p. 96). Consequently, as ABA does not aim at the causes of deviance, but only at its expression, the goal is not recov- ery, but merely “faking the becoming of normativity” (p. 105). It is a highly time-intensive form of therapy, ide- ally shaping all interaction. As Yergeau remarks, for “the neuroqueer child, ABA is life!” (p. 97). This evokes, of course, the histories of other disabili- ties, where therapy claims a civilizing effect, and it would have been useful had Yergeau drawn from these histories of psychology, psychiatry, education, and disability, and, perhaps more generally, of society and civilization. Tapping into this larger scholarship also would have been relevant to her exploration of the overlapping history of ABA as a treatment for autistic and for non-gender- conforming children or, as she puts it, queer, and neuroqueer people. In the 1960s, clinical psychologist Ole Ivar Lovaas, a pioneer of ABA, ran both a Young Autism Project and Feminine Boy Project, both with the goal to normalize deviant behavior. Yergeau makes some valid and thought-provoking points about the overlap in ther- apy directed at those two groups. Yet her admitted col- lapsing of the “finer categories of autism or gender or sexuality under the broader banner of neuroqueer” evokes as many questions as it answers (p. 100). Not least—and this goes to my main point of criticism (and confusion) with Yergeau’s approach—the reduction of all kinds of difference and deviance to “neuro,” which is particularly problematic if applied to the past as in Yergeau’s explo- ration of the history of eugenics and stimming. Neu- rological identities certainly have become increasingly fashionable, yet to me their use brings up the question of the value of simultaneously deconstructing and con- structing neurological difference. Chapter 3, “Invitation,” deals with the effects and con- sequences of disclosing autism diagnoses. Disclosure, Yergeau observes, is “both imperiled and politically gen- erative” (p. 140). Often, it is necessary for receiving services, yet it also renders an individual vulnerable to question and doubt, and to losing friendships or even jobs. It brings the potential to engender exchange and discussion, which are, as Yergeau argues from her own experience, “often agonistic, expectant of allistic refu- tation” (p. 33). Thus, the statement “I am autistic” or “disabled” is usually treated as “elliptic rhetoric,” a state- ment to be filled with meaning by the non-autistic per- son because the autistic speaker lacks the ability to do so. Chapter 4, “Invention,” finally, looks at the ways autistic communication can contribute to new understandings and definitions of (demi-)rhetoricity. Yergeau turns around the very traits that supposedly limit the agency and rhetoricity of autistic people—namely their partiality, residuality, and not-quite-rhetoricity, their use of em- bodied communication—as starting points for engagement. Such inventions, she emphasizes, need not al- ways be discursive, voluntary, or positive, to serve as “stimpoints” that trigger reactions from others. Autis- tic people, she writes, may, at times, live in “nondiscursive world[s]” that are “idiosyncratic or mutually unintelligible,” yet nevertheless, “these worlds hold value and meaning” (p. 34). 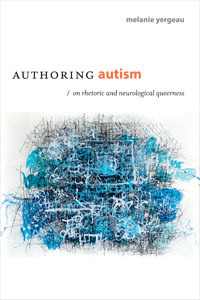 Overall, Authoring Autism provides many thought- provoking insights for disability scholars. This goes in particular for her engagement with disability theories, selfhood, and identity, and for pointing to the ways in which privilege is part of disability politics. It is a very dense book, packed with thoughts and observations that are perhaps best described as a meandering ambivalence, which is often a strength, and sometimes detracts. Here, it is Yergeau’s double perspective as a rhetorician and autistic activist that makes Authoring Autism valuable to a larger audience, on whom, as in my case, her finer points about rhetoric theory may be lost.
. Melanie Yergeau, “Clinically Significant Distur- bance: On Theorists Who Theorize Theory of Mind,” Dis- ability Studies Quarterly 33, no. 4 (2013), http:// dsq-sds.org/article/view/3876/3405.